This week I decided to share The Cloud Spinner and Extra Yarn with the preschool storytime kids. See reviews in my previous post. We turned it into a fiber arts storytime! I also added a third book to the mix, Where is the Green Sheep? 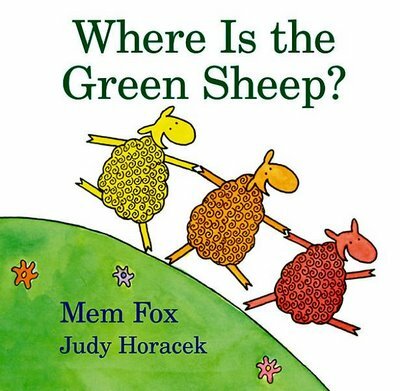 written by Mem Fox and illustrated by Judy Horacek (Houghton Mifflin Harcourt, 2004) so we could talk about where the wool comes from that is used to make all of the hats and mittens we wear for much of the year. It’s a silly book that includes lots of opposites and great opportunities for color recognition and vocabulary practice. It’s a fun book to improvise with or read the text as is. Before I read Where is the Green Sheep? 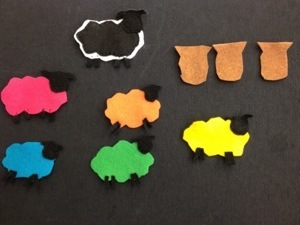 I taught the group the old song, Baa, Baa Black Sheep, using the felt board. Most kids had never heard the song before and sat intently as I sang. After the story, I brought out my colored sheep so the kids could really learn the song and continue practicing their colors. The visual of the felt sheep and three bags of wool helped the kids learn this song. By the fifth time around, those little ones were singing their hearts out. 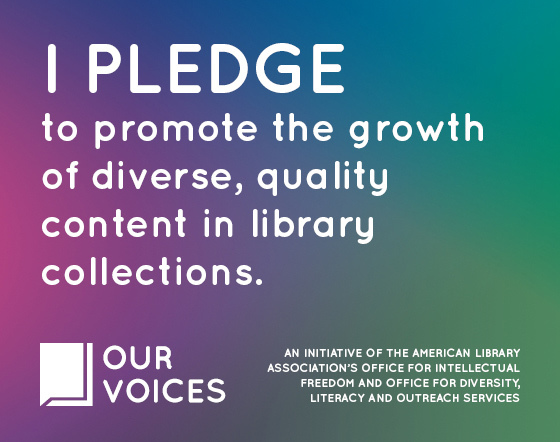 At the end of storytime, when everyone was getting their boots and coats on, a two year old started singing “Baa, baa, baa, baa, baa, baa, baa.” Her mom was amazed, telling me that her daughter had never heard the song before. The mom then started singing the rest of the song to her. It put a smile on my face! We worked on a couple of projects during craft time today. Some kids made cloud animals similar to some of the cloud creatures we identified in The Cloud Spinner. Feel free to download the templates for the cloud fish and the cloud bunny. 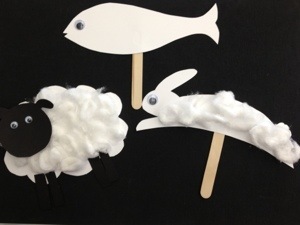 The cloud sheep craft and template I found at All Kids Network. I had a teen volunteer help me cut out the templates for each so the kids could focus on gluing the cotton balls in place. STEAM moment: While this storytime focused on fiber arts, we also spent time talking about the clouds in the story. It offered me an opportunity to introduce the water cycle and the story’s message of conservation. 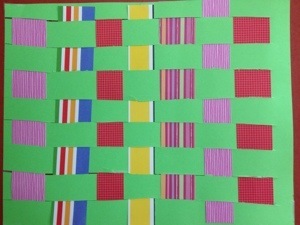 The other project we tried is paper weaving. I found a great example at Art Projects for Kids. This was popular with the older kids who sat and really focused on weaving the paper strips over and under. Some kids alternated the weft (or warp?) and some only did one pattern. You could see the mental wheels spinning! It was a great project for adults and kids to do together and the parents were very patient. One parent even commented that it would make a great project to do at home (it requires very little in the way of materials). 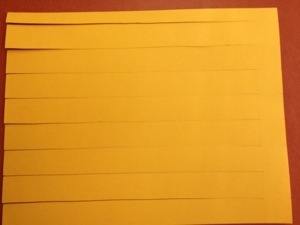 I used one sheet of cardstock for each child and cut eight lines from one end to within an inch of the other end. Having one end free helped the kids maneuver the strips more easily. 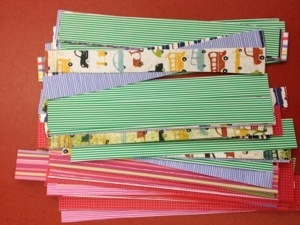 I found colorful scrapbook paper for the strips the kids wove into the cardstock. The contrasts were beautiful and easy for the kids to see their progress. When the weavers were all done, we taped the back of the cardstock where needed so the strips wouldn’t move around. A note for next time- I’ll make the strips a little longer than the 8″ strips I used this time and have parents trim the hanging edges. The paper fit well, but it would have been easier for kids to handle if it was a bit longer. With a little more lead time, I’d also have a weaver come to storytime and demonstrate on a loom so kids could see weaving in action.